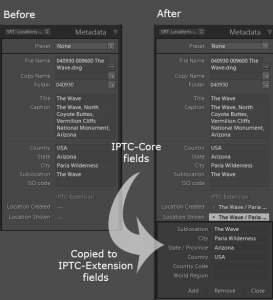 Matt Dawson has releases a new plugin that extends the Metadata section within Lightroom’s Library module. It adds a number of pre-defined metadata layouts (tagsets) that configure how much of an image or video’s metadata is visible at a time. 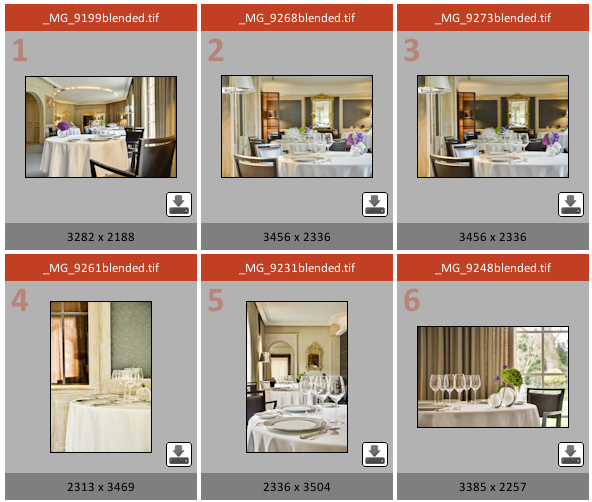 These new layouts have been designed to help focus on the important metadata when photographers are performing key tasks such as managing copyright and model releases for their digital assets. You can check it out on the plugin’s main page. Uusheimo Photography have created a new web site using out Impact WSPP plugin. It’s a great design and really shows off what can be done with a little thought. Capture Time to Exif is essentially an in-Lightroom interface for Exiftool, Phil Harvey’s highly-respected “platform-independent Perl library plus command-line application for reading, writing and editing meta information in a wide variety of files”. Update the Date Time Original EXIF field of scanned images. 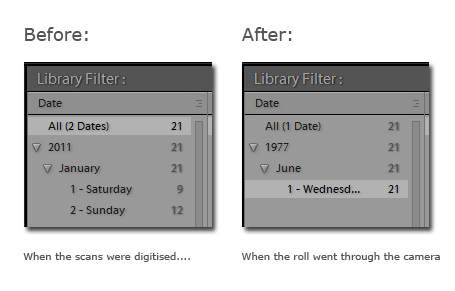 Lightroom’s filter panel and smart collections can then find the images by searching for when the pictures were originally taken rather than when they were digitised. Write other EXIF and IPTC information such as the camera model and maker. You can enter whatever Exiftool command line arguments you choose. Store frequently-used command line arguments as presets. Writing to proprietary raw formats is disabled. Use this method if you really want to write to proprietary raw formats. The Bad News: The promotional offer period is now over. The Good News: The price is only going up by £5 to £25, so the WSPP plugins still represent exceptional value for money compared to the nearest equivalent1 (although really, there is no true equivalent to WSPP’s unique approache to web site creation). The Fabulous News: You now get a contact sheet view too…. Until now the WSPP series has been fine tuned to display your portfolio images in their best light thanks to a beautiful presentation. With the latest release we starting to address the needs of your clients. The new contact sheet view can be applied on a per gallery basis, and is designed to be used on the galleries in your client area. The images are displayed in a very nice grid view, and there are options to allow the user to download images and to display geographical information via Google Maps. By default the shape of the grid changes dynamically to fit the window size whilst still remaining centered for the best aesthetics – this was technically very challenging and to the best of our knowledge this is the first time this has been achieved successfully across different browsers. We’ve updated our client area demonstration gallery to use the new contact sheet view. Visit the client gallery to see it in action (username and password are both “client1″. This release is a free upgrade for existing users. You can now choose to use the main gallery index page as the starting page for your site. There are now various options for positionning the thumbnails on the gallery index pages. 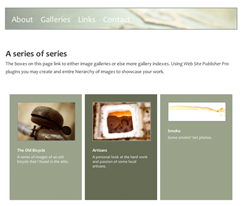 Adding a border around the gallery index boxes when they are touching now looks correct (no more doubled up borders). Lots of you have been asking for this. The number of options displayed in one go when designing your page has been significantly reduced. Instead, options for many pages types (gallery index, contact page, gallery…) are only displayed when viewing the page in question. This makes it a lot easier find the option your looking for, and paves the way for upcoming features that would have otherwise overwhelmed the panal rail. Menu options can now have separators between them when the menu is horizontal. All the tick boxes for adding outlines to various elements have been removed – instead you should now set the border width to zero. You may need to update your user templates to removed unexpected borders – sorry about that. You’ve been asking for two things. Lots. And lots. Now you’ve got them…. With Impact WSPP 1.20 you can now overlay captions onto your images. You can also specify a fixed size “matting” to go around the image. If you wish you can use this area to hold the navigation bar, the descriptions and the position dots so that they don’t overlap your images. Once these features have settled in and we’ve had your feedback we’ll be porting them over to the standard version of Impact too. There are other changes too, such as a back button to take you to the parent level, and the ability to put links into your gallery descriptions. One noteworthy change – the text size of the descriptions on the gallery index pages is now fixed in pixels rather than points. This will give better consistency across browsers, but you’ll need to tweak the size of your text in any existing templates you’ve made. We’ve just release a big update to Impact WSPP and Filmstrip WSPP that adds password protection and hidden gallery support. There’s also another nice surprise – read on…. Passwords can be added to either individual galleries or to entire sets. Multiple username-password combinations are supported, so you can manage access to galleries with a lot of finesse. Both galleries and sets can now be hidden from the main gallery index too. Used in combination with the password control, this can be used to provide you with a private client area. The system is very flexible and can be moulded to meet just about any need. Here’s an example that may be suitable for a wedding photographer, and here’s another that’s more suited to a commercial photographer. You can read more about the privacy settings in the manual. You’ll notice that there’s now an extra tick box next to the list of options for selecting the image from a gallery to use on the index page. This box tells the plugin not to use the image in the gallery itself – but to use it only for the index page. This is great if you wish to create a cropped virtual copy of an image to use on the index but to then show the entire image in the gallery. We’ve received an incredible response from our new Web Site Publisher Pro series of plugins. Of particular interest to us was the large number of people requesting a WSPP plugin based on a horizontal scrolling gallery. Not wishing to disappoint, we temporarily put aside the development of the galleries that we were working on and starting working on a solution. Impressive and memorable viewing experience thanks to scaled-to-browser-height images. Images are preloaded and faded in as they become available. Very configurable interface. The “filmstrip” can be displayed in many ways thanks to the ability to add spacing and borders. Optional fixed size header and footer areas give you space to put menus and controls that won’t interfere with the images. Individual annotations can be displayed on the images. Annotations can include image metadata and may be formatted with Markdown. The display of annotations can be turned on and off by the viewer. Custom pinch gestures for iOS devices such as the iPhone and iPad allow visitor to change the height of the strip. We’re very excited to announce our revolutionary new way to create an entire web presence directly from within Lightroom. Our Web Site Publisher Pro plugins are very different from traditional Lightroom Web Engines. Rather than creating a single gallery in the web module you instead design the look and feel of your entire site from there, and then create a Publish Service in the library module with which to upload your site. By adding collections and collection sets to the publish service you can create a complete web presence that includes a structured hierarchy of galleries along with other pages such as the home page, a contact page, a links pages, etc. It’s really never been so easy to create a web site from within Lightroom, it’s never before been possible to create a gallery hierarchy using collections and sets, and no other web engines allow you to incrementally upload just your changes to the site. 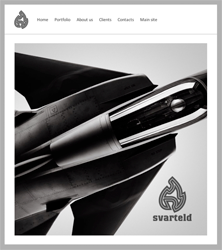 To really demonstrate just how flexible the layout options are we asked photographer Peter Karlsson at Svarteld if he would create a site to show off the plugin. We’re not sure what’s impressed us most, the fact that Peter willingly put aside his day to come up with something great, or the fact that the plugin was powerful enough to allow Peter to come up with something this great in just one day! We’re starting to roll out this series with a WSPP version of our popular Impact gallery, and versions for Jigasawrus and Elegance will soon follow.